Human Rights Watch Southern Africa Director Dewa Mavhinga said Zimbabwe risks having another sham election unless President Emmerson Mnangagwa fulfills his promises and implements genuine electoral reform before the July 30 general election, May 8, 2018. Human Rights Watch (HRW) says the Zimbabwe government's failure to carry out legal and electoral reforms threatens the credibility of the country's general election next month. 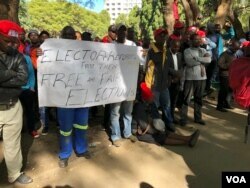 Without electoral reform before the July 30 general election, Zimbabwe risks having another sham election, said HRW's Southern Africa Director Dewa Mavhinga. "There is lack of reforms that risks credible elections," he said. "We call on President Mnangagwa to act on his pledge for free and fair elections. We ask President Mnangagwa go beyond mere rhetoric and genuine steps to level the playing field for candidates and their parties. Speaking Thursday in Harare, Mavhinga called for institutional bias to be eliminated. "A key step would be whether state [owned or controlled] media gives equal coverage to all political parties without bias or favor," he said. "Zimbabwe's military and other state security forces have for many years interfered with nation's political and electoral affairs adversely affecting the right of Zimbabweans to vote for candidates of their choice." Human Rights Watch says its research in May found security forces involved in the electoral process, abusive laws that remain in effect, and violence and intimidation by the ruling party all contribute to an environment that is not conducive to free and fair elections. HRW said it discovered at least 15 percent of the Zimbabwe Electoral Commission's leadership is serving or former military officials. Mnangagwa faces Nelson Chamisa of the country's main opposition party, the Movement for Democratic Change, among several other opponents. The July 30 election will be the first in Zimbabwe's 38 years of independence without Robert Mugabe, who resigned last November after giving in to military led pressure. Mnangagwa has lifted a ban on Western election observers, but the opposition says that is not good enough. This week, opposition parties protested the Electoral Commission's refusal to release the voter roll and said Mnangagwa must have the roll audited if Zimbabwe is to have a credible election.